2 of 5 Heat 1 tablespoon of the olive oil in a large nonstick skillet over medium heat; add onion and cook 5 minutes until soft. Add garlic and pepper flakes; cook 1 minute. Add wine; cook 3 minutes. Stir in marinara and black pepper; simmer 5 minutes. 3 of 5 Meanwhile, lightly salt water and add linguine; cook until tender but still firm, about 8 to 10 minutes. 4 of 5 When linguine is almost done, heat a large nonstick skillet over medium-high heat; add remaining oil. Add shrimp and cook, stirring, until pink, about 2 minutes. Scatter garlic on top and toss. 5 of 5 Drain pasta thoroughly and place in large serving bowl. 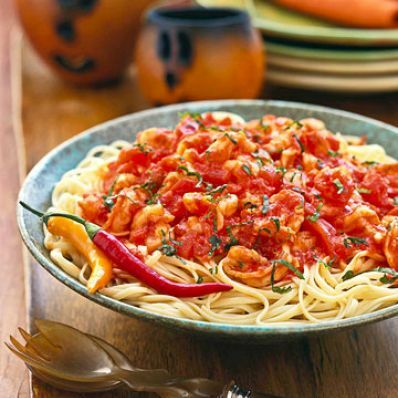 Toss with marinara sauce; place shrimp on top and serve.